Meta tags are meant for the correct display of your website in search engine results and social media. On uKit, meta tags are added in the Builder mode > Site Pages > the "gear" icon. Title is a short title of a page, recommended length is 70 characters. Description is a brief summary of the page content, recommended length is 150 characters. Keywords contains a list of keywords which are separated by a comma. We recommend to add from 2 to 5 keywords. 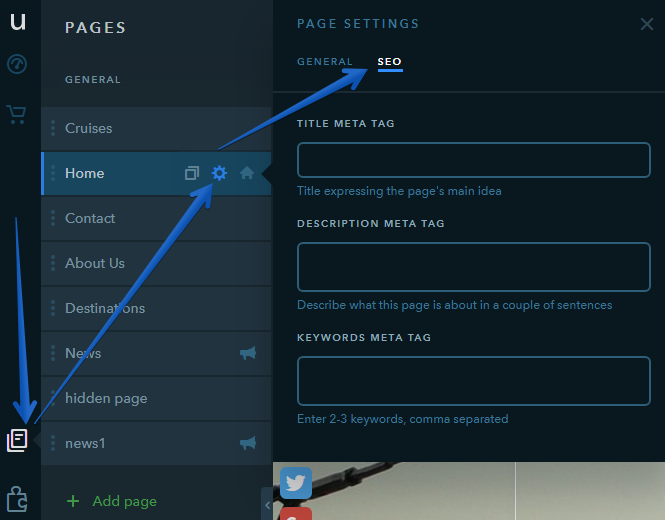 If a 'Title' meta tag is not indicated, the name of the page will be used instead. You need to publish the website to get the changes applied.